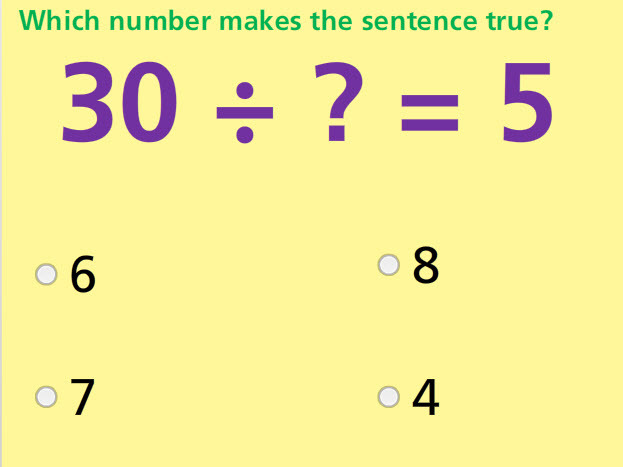 Take this online assessment to show how well you understand dividing numbers. This test requires the student to find the missing number in a division problem. This test has seven multiple-choice questions and three drag-and-drop questions. It is recommended that you find the factor that when multiplied by the given number gives a product equal to the second given number in the division equation. Determine the unknown whole number in a multiplication or division equation relating three whole numbers. For example, determine the unknown number that makes the equation true in each of the equations 8 × ? = 48, 5 = 􀃍 ÷ 3, 6 × 6 = ?. Return from this Division Fill in the Blank up to 10 Math Test to the Elementary Math Tests , 3rd Grade Math Tests webpage, or to Math Tests.